The pet sitting business has been ear marked by the U.S. Bureau of Labor as a small business industry that will thrive with the coming years. Every year an estimated $41 billion is spent on U.S. household pets. 63% of U.S. households own a pet. As these numbers present, the pet sitting business is fast becoming one of the best small business ventures that an individual can undertake. Two amazing women I know personally are taking advantage of this exciting time and they are former real estate agent, Lynne Cline of Gilbert, AZ and 10-year-old, Alexandra Barikhan of Lake Forest, California. I wanted to share their stories with you, from their point of view, and how my book, The Real POOP SCOOP on Pet Sitting helped them get their business up and running! Bonnie’s understanding and great care of my animals as my pet sitter inspired me to leave the real estate industry and start my own pet sitting business. The Real POOP SCOOP on Pet Sitting guided me every step of the way and provided invaluable information for me to become successful. 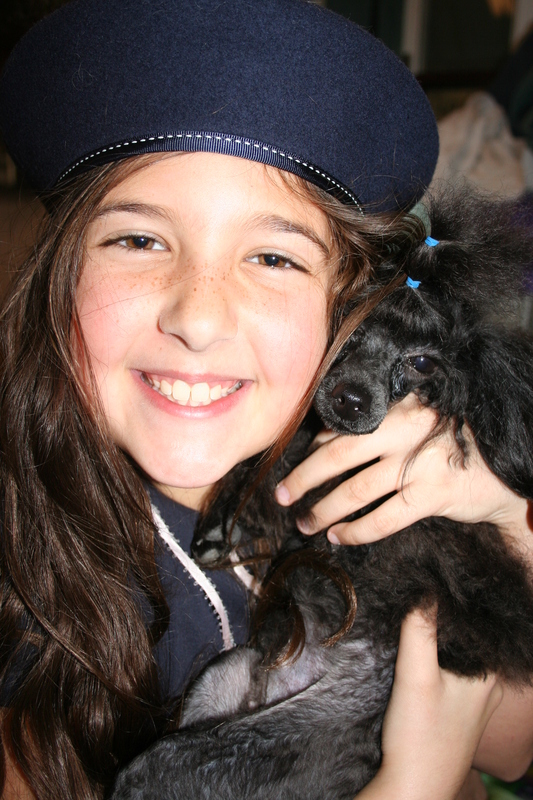 I live and operate my business, Urban Tails Pet Sitting, in Gilbert, Arizona. Starting the company in 2006 with 5 clients, I’m now approaching 30 clients and that number continues to grow. My array of services, along with client pictures, rates and policies can be found here. The Real POOP SCOOP on Pet Sitting positioned me for the realities of owning a pet sitting business and allowed me to develop the fundamentals needed to get it started as well as market it. It’s really my “go-to” place for any miscellaneous questions I may have. It feels great to see such an amazing profit versus what I was making as a real estate agent. I received The Real POOP SCOOP on Pet Sitting as a Christmas gift and even though I’m 10 I’m already starting my dream of becoming a pet sitter. Starting in my neighborhood, and with friends of my family, I make time to pet sit before and after school, and on weekends. It’s fairly small now, but I’m taking the pet sitting business tips from the book very seriously. My services are not limited to basic pet care, but also includes taking in the mail, cleaning up the yard and litter pans, keeping lights turned on at night, and taking out the trash. My mom helps me supervise the needs of the clients, and I charge based on the services requested. I’m so thrilled to call myself a pet sitter. The book was the perfect gift. My background in animal care comes from my family who raise and show champion dogs and horses. Even from birth, animals have been a large part of my life. Not only do I handle the dogs, smooth coated collies, in the junior handling classes, I also show a beautiful champion Friesian stallion. Getting ready to do a book signing in Las Vegas! So excited! If you’re in the area, stop by and say hi. We’ll be at the Petco on Warm Springs and Durango from 1-4 pm on Saturday July 23rd. Proceeds to benefit the Great Dane Rescue! For a donation of $15.00 or more, you will get an autographed copy of my book “The Real POOP SCOOP on Pet Sitting” and a gift bag. Supplies are limited so come early. I will also be giving away one free autographed book, in a drawing! 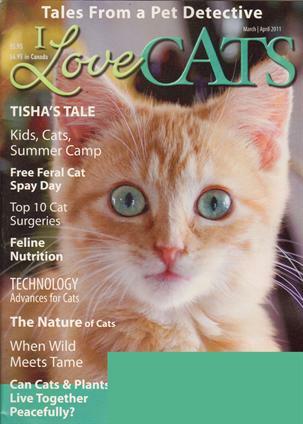 I’m excited to share that my book, The Real Poop Scoop on Pet Sitting, was featured in the March-April issue of I Love Cats!! Check out their website. They have links for donations to help homeless cats, tips for keeping your kitty healthy, a poetry corner, a Cats in the News section, books worth reading (mine) and so much more! They’re also a lot of fun to “like” and follow on Facebook. Pick up a copy today or register online for a free issue! This is so exciting for me, as an author, to be featured. Thank you I Love Cats! Because… I really do! Jennifer was the winner of my book giveaway! I’m taking a book off the shelf to send you right now! Thanks to all for entering! I may do another giveaway soon so be sure to check back. I’m feeling extra spunky today so I’m going to giveaway a free copy of my book! To enter, please leave a comment with your pet’s name and what you love best about him or her. I’ll be drawing a winner this Friday at noon. I’m so excited to hear from you!